Beijing has a plan for a new regional security architecture, and it’s not based around alliances. One of the most concrete speeches delivered at this years’ Xiangshan Forum, the annual regional security conference organized by China and held earlier this week in Beijing, was made by Liu Zhenmin, vice minister at the Chinese Ministry of Foreign Affairs. He clearly called for the “building of an Asia-Pacific security architecture”. China’s ambition to create such an architecture is not new. In recent years, Chinese officials and researchers have brainstormed intensively on this topic, starting by analyzing what already existed in other regions of the world and considering a diversity of options (such as the creation of an “OSCE type of institution in Asia,” among other ideas and options). The need to promote the “establishment of a regional framework for security and cooperation” was already stated by Xi Jinping, in his May 2014 speech at for the 4th Summit of the “Conference on Interaction and Confidence Building Measures in Asia” (CICA) held in Shanghai, and underlined again in the White Paper on China’s military strategy, published in May 2015. But by emphasizing this need further and in more precise terms during the Xiangshan forum – in front of an influential international audience – China is now officially launching an international brainstorming on this topic, in its own terms and conditions. Liu Zhenmin explicitly mentioned several conditions. The most striking of them is that “the security architecture should be held together by partnership” – i.e., not by any formal alliance system. The geographical scope of this architecture remains unclear. The right term to be used is not “Asia-Pacific,” but “transpacific” security architecture, according to a high-level think tank official. But what is certain is that China will count on its Russian partners, who were granted a lot of speaking time during the Forum, to support the building of the architecture, which could be perceived as an alternative to the U.S.-led alliance system in the region. China will also count on its Central Asian partners, who should not be torn in two between Moscow and Beijing on this matter. In addition, China will also aim at integrating ASEAN countries as much as possible. Liu Zhenmin mentioned the “ASEAN way of handling issues” in his speech. 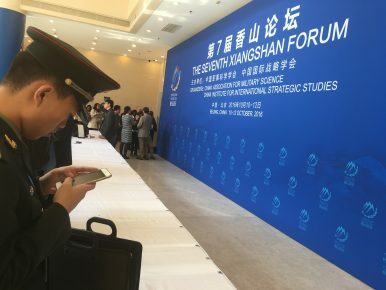 And General Cai Yingting, chairman of the China Association for Military Science, also emphasized during his Xiangshan forum speech the need to “stick to the family spirit” existing in Asia. In broader terms, the architecture could potentially include countries that are part of the U.S.-led alliance system, but also the United States itself. This was confirmed by several Chinese researchers who contributed to the domestic brainstorming and policy-making discussions on the topic, and is in line with the official discourse on “inclusiveness.” If the geographical scope of China’s new regional security network remains focused on Asia at the moment, the general impression is that it could include countries located well beyond the Asian continent in the long-term. “China is willing to work with all countries to explore new security architecture,” declared Liu in his speech. The creation of a formal regional security institution does not seem to be an option anymore for Beijing, which is conscious of the many obstacles that such a project would face in the region and beyond. Instead, the softer option of a “comprehensive, multi-level and multilayered network” – another condition mentioned by Liu – has been preferred. In practical terms, China aims at upgrading and building bridges between the many existing regional security institutions and mechanisms in which it has a significant say: the Shanghai Cooperation Organization (SCO, mentioned extensively by Chinese speakers throughout the Xiangshan forum), the Conference on Interaction and Confidence Building in Asia (CICA, which China is currently trying to upgrade under its presidency, extended up to 2018), the ASEAN-centered meetings (ARF, ADMM+, etc. ), country-focused mechanisms to a lesser extent (such as the six-party talks). China also considers an essential part of this network the existing regional security forums (such as the Xiangshan forum itself), and the many other multilateral track 1.5 and track 2 forums, seminars and workshops that the country is planning to organize or co-organize in the coming years on the topic of regional security governance, both on its territory and abroad. This plan, suggested in Liu’s speech and confirmed by several Chinese think tanks, is in line with China’s large-scale investment in international forums organization under Xi Jinping (focusing so far on the promotion of the “Belt and Road” network). Multilateral track 1.5 and track 2 forums are now considered by Beijing as a key tool to lead regional and global governance restructuring – a top priority of China’s diplomacy today. In addition, China will surely support its new regional security network by linking it to existing regional economic and development-related discussions, forums, and institutions (certainly including the “Belt and Road” and its related “interconnectivity” networks). The new regional security architecture “should draw strength from common development and achieve inclusive and mutually beneficial development,” stated Liu. Along the same lines, Chinese researchers are increasingly underlining that global economic governance reform is at the core of global governance reform. The various track 1.5 and track 2 meetings to be created will probably be “open to all,” but Chinese organizers will most likely grant a preferential space to its partners and potential partners, and propose co-organization with them, as is already the case in China-initiated forums on other topics. These meetings may grant a certain brainstorming space to a diversity of participants (likely to include military, diplomatic, academic, business, and media representatives), but the agendas will most probably be framed by the preconditions indicated in Liu and other official’s speeches. The bridge-building process between various institutions and forums is likely to be supported by the coordination and harmonization of the agenda on the basis of these preconditions, in line with China’s key foreign policy and security priorities. The network may also be consolidated through greater coordination and cooperation between the secretariats of various regional security institutions and forums. In parallel, the new multilateral forums may ultimately enable Chinese organizers to channel regional brainstorming on security governance toward Beijing’s own concepts and objectives, fine-tuned over the last years during the national brainstorming process. In particular, China may channel countries who do not have such a clear or comprehensive approach towards regional governance reform. For strategic purposes, China’s own vision and methodology for the building of the regional security network is likely to remain presented in broad terms only, and the network itself will remain flexible, adaptive to regional opportunities and responses in the coming years (as it is already the case for China’s “Belt & Road” network, which is a ‘work-in-progress’). What is certain is that the building of a new Asia-Pacific security architecture is more than ever a key priority for China, and that the architecture-building process has been launched. Dr. Alice Ekman, Head of China Research, Center for Asian Studies, French Institute of International Relations (IFRI), and Associate Lecturer at Sciences Po. Can the New China-India Thaw Last?How China Wins Friends and Influences PeopleAmid Tensions With US, China Holds An Unusually High-Level Meeting on DiplomacyA West in Crisis, an East Rising? Comparing the G7 and the SCOAre China-India Relations Really Improving?